Taught by Michael (“Mike”) B. Frisch, Ph.D.
Click here for Ten Questions for Mike Frisch, Ph.D. Listen to Ben’s live teleconference interview with Mike Frisch. This included participants from throughout the world. To stream it online, use the Online Link here. For a Download Link, click here. You may want to begin 45 seconds into the interview (slide the vertical bar from left to right. You can see the time elapsed on the right of the horizontal bar) You can also skim through any parts of the entire interview (by, again, sliding the vertical bar from left to right). This course is relevant for anyone interested in applying positive psychology to their own lives and to the lives of their clients. It is an award-winning, systematic, evidence-based, research-validated approach that is both simple and powerful. It is for coaches, therapists, consultants, teachers and all others who work to improve the quality of peoples’ lives. You will learn an approach to positive psychology that Ed Diener, the world authority on happiness, says is “state-of-the-art, evidence-based, empirically validated, and an outstanding guide for all professionals interested in learning about the practice of positive psychology”. You will learn an approach to greater happiness, meaning, and joy that is validated in two NIH-grant funded randomized controlled coaching trials conducted by James R. Rodrigue and his colleagues at Beth Israel and Harvard Medical Centers in Boston. –Dr. Paul Lloyd, Executive Coach and Past-President of the American Psychological Association’s Society of Consulting Psychology. You will learn an approach to positive psychology practice that is “one-stop shopping” with everything you need in one book and with one approach. You will learn an approach to positive psychology practice that teaches you how to practice in a simple step-by-step fashion. You’ll learn everything from planning interventions to documenting your success scientifically using the evidence-based Quality of Life Inventory or QOLI®. You will learn an approach to positive psychology practice rooted in virtue ethics that teaches an Eight-Step Model for Ethical Decision-Making. Activities: Occupations-Avocations: Play, Work and Retirement Pursuits, Helping, Learning, Creativity, and Spiritual Life. You will learn the versatile, “Five Paths to Happiness model”, providing interventions for any problem or area of life. You will learn a major approach to positive psychology that has been taught at the University of Pennsylvania in Martin Seligman’s Masters in Applied Positive Psychology (MAPP) Program. And you will learn an approach to coaching that addresses all three types of happiness recently identified by Daniel Kahneman and Ed Diener in their analysis of Gallup World Poll data. 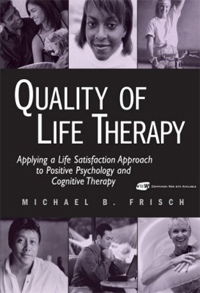 The textbook for the class is Mike’s award-winning Quality of Life Therapy: Applying a Life Satisfaction Approach to Positive Psychology and Cognitive Therapy. To order the book, click here. It’s an outstanding book and essential for learning this approach. It comes as a large trade paperback which includes a CD. The Kindle version does not have the CD. problems, and document positive outcomes. 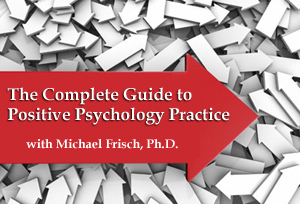 Mike Frisch, Ph.D. is a Professor of Psychology in the Department of Psychology and Neuroscience at Baylor University. He is the author of the award winning Quality of Life Therapy, Quality of Life Inventory Handbook for Laypersons, Clients, and Coaches, and co-author of Creating Your Best Life.